Welcome to Island Girl Expressions! Throughout this site, you will find beautiful custom handmade artisan jewelry for all occasions. 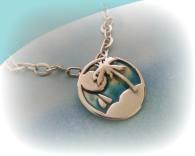 My Metal Clay designs are versatile, unique, one-of-a-kind and high quality. There are hundreds of items to choose from, but if you don't see exactly what you're looking for, I am more than happy to customize a piece for you. Precious Metal Clay was invented in Japan in the early 1990's. It is made from powdered precious metal combined with an organic binder and water. It can modeled, molded, or sculpted in a way similar to ceramic or polymer clay. When heated to a high temperature in a kiln, the binder burns away, and the precious metal particles sinter (or fuse) intol solid metal. Fine silver is .999 (almost pure silver), sterling silver is .925, copper, bronze, rose bronze, white bronze and steel are 100% metal. With our Metal Clay, we are able to create one of a kind jewelry featuring fingerprints or footprints of your children and loved ones. Not only will you want to wear them, you'll want to give them as keepsakes to someone you love. For fingerprints, we can either send you the mold with detailed instructions to take the print, then you send it back, or if you have or can take a good ink print, you can scan and email it to us. For footprints, we ask you to scan a birth certificate with footprints or take an ink print then scan and email it to us. We can also do this for your pets, but it must be a scanned print as molded prints are too large. From there we can create bracelets, necklaces, earrings, key chains, Christmas ornaments and custom pieces. We can also add birthstones, names, initials, birthdates or quotes. Browse through the Everlasting Prints Gallery to see some of the available designs or email me at handmadebycl@aol.com for a catalog and price list. I developed my love for the islands after my first Caribbean cruise in the early 1990's. Since then, I have spent many vacations visiting the various islands and truly love the people, the flora and fauna, and of course, the incredible waters. Much of my work is inspired by these trips and my ultimate goal is to one day be an "Island Girl". I currently love residing in Colorful Colorado, and you will also see inspiration from my home state, as well as my roots in Kansas. My love for crafts led me to jewelry design a number of years ago, then once I was introduced to PMC, I must admit, I became totally obsessed! I am studying and training to achieve the highest level of skills possible and I work diligently to stay informed of the latest trends. I love to spend countless hours in my studio designing and creating one of a kind pieces that are meticulously designed and finished. I work with fine silver, sterling silver, copper, bronze, rose bronze, white bronze and steel metal clay, sterling silver wire and beads, a multitude of beads and precious and semi-precious gemstones. I genuinely welcome custom orders, I offer wholesale discounts for large orders and if you are interested in featuring any of my items in your store or gallery, please contact me.